Jorge Lorenzo has called on Ducati to adopt a more Yamaha-like philosophy when it comes to developing its MotoGP bike, with more focus on chassis improvements. 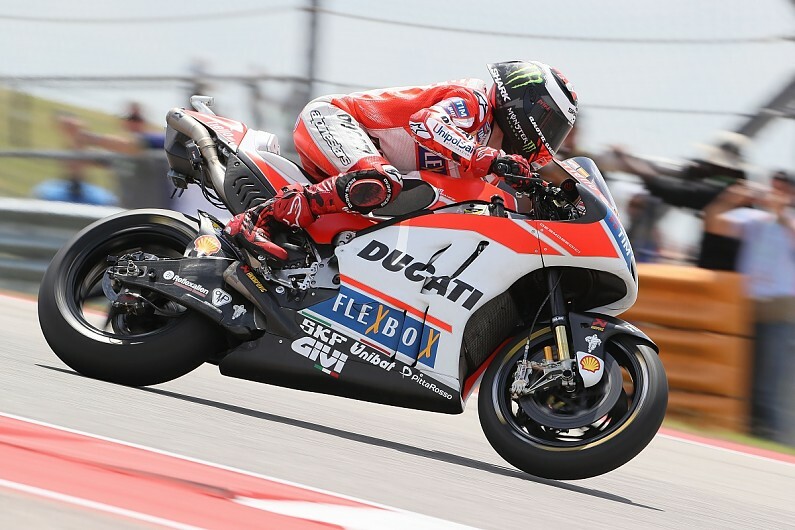 The three-time premier class champion has endured a tough start to his Ducati career since switching from Yamaha, with his ninth-place finish at Austin his top result so far. It puts him 13th in the standings on 13 points, 17 behind fourth-placed team-mate Andrea Dovizioso, who feels Ducati needs to begin thinking longer-term about how to catch chief rivals Yamaha and Honda. Lorenzo believes the Italian marque could learn from the approach of his former employer, which regularly introduces chassis updates, and that a "change of priorities" is needed to focus more on this area. "Yamaha and Ducati are two very different manufacturers, with two different philosophies," said Lorenzo. "Yamaha was always obsessed with the chassis, with making the rider's life easier. "Ducati, on the other hand, has opted over the past 10 years to produce the most powerful engine and to manage it with good electronics. "Maybe now we need to change priorities and, apart from continuing to develop the engine, try new types of chassis to make turning easier and make the rider's life easier." Ducati took a pair of wins in 2016, one apiece for Dovizioso and Andrea Iannone, ending a five-and-a-half year run without a victory. It led development of aerodynamic appendages on bikes' fairings, and branded the push to end the practice at the end of last season as rivals attempting to peg Ducati back in an area where it had an advantage. Ducati is yet to use the radical winglet-replacement fairing it has built for 2017 in a grand prix weekend, and Lorenzo said it was clear at Austin that the loss of winglets was compromising how he could ride the Desmosedici. Asked if wheelie control was a particular problem, Lorenzo replied: "Not as much in wheelie, but more in front contact almost everywhere. "We lose some contact so in some areas we have to close some more throttle, we lose a little bit more than the other brands. "They decided to change the rules, so we have to adapt our evolution with these rules. "So many accelerations [at Austin], we don t have the same force in the front. "But it's like that, we have to forget that and work to improve the bike without the wings."